Want to be notified of new releases in Vifon/ledger-web? Ledger Web was initially created to bridge the gap between a smartphone and Ledger CLI by exposing a HTTP API. 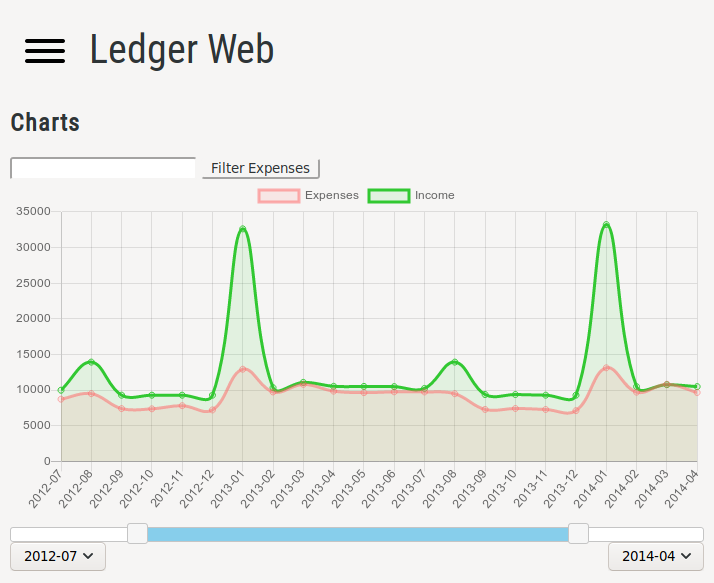 Since then it evolved into a more general web UI for Ledger. HTTP API for submitting new payment entries. Rules to override the attributes of the entries submitted via the API. A web form for submitting new payment entries. 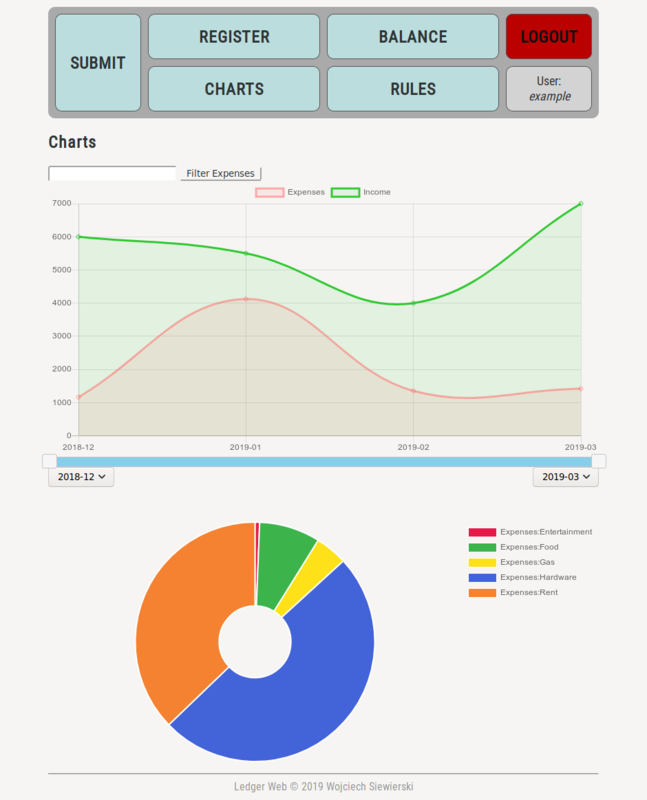 A web preview of the basic Ledger data. Support for multiple users with separate ledgers and rules. 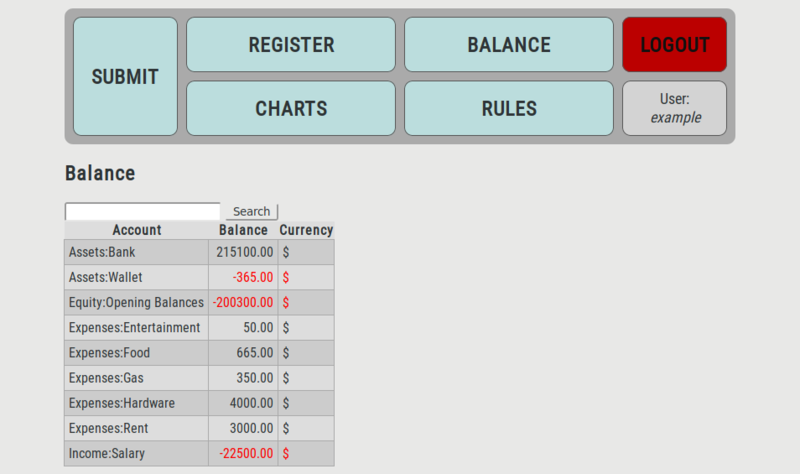 A responsive UI suitable for mobile devices. Can act as a very basic Progressive Web App (PWA). I consider Ledger Web a companion to the regular Ledger CLI, not a replacement, so it tries to add things missing in Ledger (+ some convenient goodies) while not reinventing the wheel. These are some features visibly missing from Ledger Web. There is no support for modifying the ledger file other than appending new entries. The syntax is flexible enough that I didn't want to risk corrupting the existing data. The most noticeable effect of it is that creating a rule from an entry does not change that entry itself, only the future ones like this one. The register view won't show any included files' contents, it only reads the main file. The other views are free from this limitation. No support for complex entries, for example with more than two accounts. Personally if I need to enter a complex entry with no access to Ledger CLI, I account it to Expenses:Uncategorized and then refine it at my PC. Ledger Web is designed to be constantly running on a server so it's easily accessible from mobile devices. That being said, it's possible to run it on demand locally for example just to analyze the charts. The instructions below assume the former case though. Set up the database. SQLite is used by default, it can be changed in ledger/settings.py. Add a new entry in the Ledger paths table for your user, pointing it to your Ledger file. If you want to use the HTTP API, add an access token too. A token should be between 32 and 256 characters long. You'll need to generate it yourself, for example with pwgen 256 1. Customize ledger/settings.py, specifically you may be interested in the last 3 options. Generate a new SECRET_KEY, for example with this snippet. Enter your domain and possibly a localhost in ALLOWED_HOSTS. Set STATIC_ROOT, for example '/var/www/ledger' + STATIC_URL and run ./manage.py collectstatic. Set up a reverse proxy in a HTTP server, for example Nginx, a config file included in examples/ledger.nginx.conf. Additionally you need to pass the access token in the request BODY as JSON (under the token key). Note: This route is likely to be deprecated. 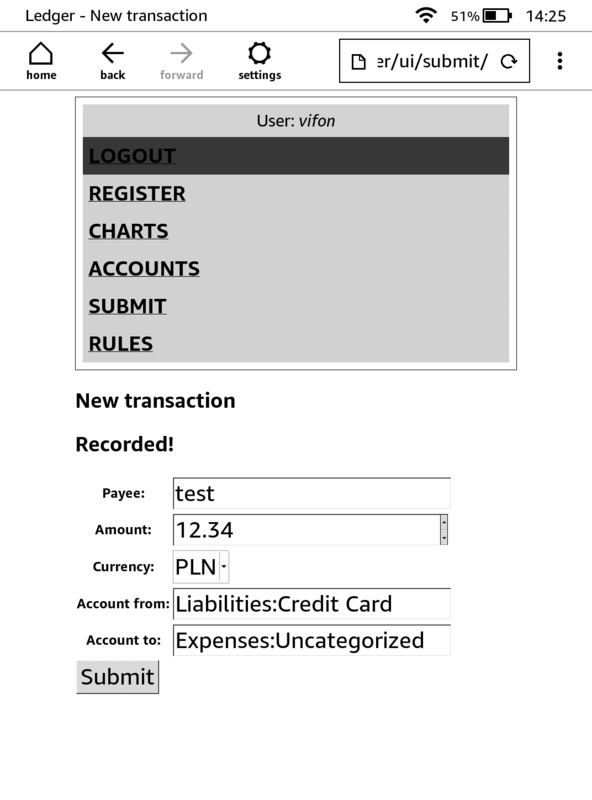 This route accepts the same arguments as the previous one (account_from, account_to, payee, amount) but as JSON. If the payee submitted via the HTTP API matches one of the regexps in the added rules, the rule overrides the data passed in the HTTP request. It can be used to process and/or clean up automated requests on card payment (left as an exercise for the user).